You never know when you might need the following home remedies for dandruff. Half of us experience dandruff—dead skin cells that flake off the scalp and often land on our shirts. No one is absolutely certain what causes it but no amount of washing will make it go away. Overall dry skin – your scalp is skin, too. Diet – zinc, magnesium, B-complex vitamins, and omega-3 fats are essential for healthy skin. A deficiency of any of these can contribute to dandruff. Disease – some neurological and immune system illnesses tend to contribute to dandruff. Hair brushing habits – manual exfoliation goes a long way to rid the scalp of dead skin cells; not brushing or combing your hair often enough allows flaky skin to accumulate and become noticeable. Seborrheic dermatitis (oily, irritated skin) – a condition caused by a fungus that feeds on the oils on your scalp. Shampoo – an allergic reaction to a hair product or shampooing too often can irritate the scalp and promote flaking. Skin conditions – eczema, psoriasis, and other skin problems often lead to dandruff. Stress – yes, it affects the outside of your head as well as the inside. Yeast – people who are sensitive to yeast often have dandruff. It is less prevalent during the summer when sunshine kills yeast on the skin. 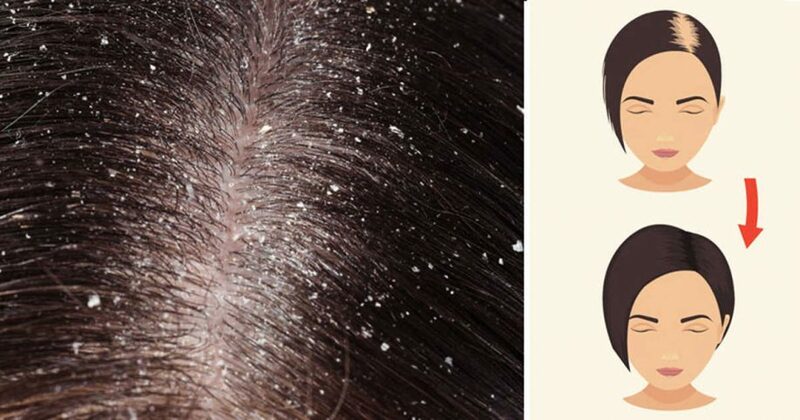 Although it’s very common, finding a way to get rid of dandruff can be a challenge. There are plenty of anti-dandruff shampoos on the market but they often contain harsh chemicals that can damage hair and are absorbed into your body through the skin. 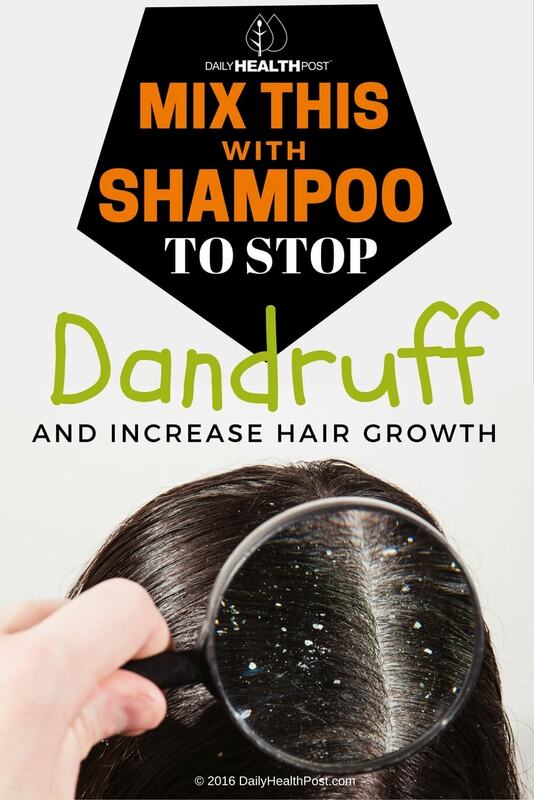 Home remedies for dandruff are not only less expensive, they are also much healthier to use than store-bought products. Apple cider vinegar can be mixed in a one to one ratio with filtered water and spritzed on the scalp using a spray bottle. Leave for 15 to 60 minutes and wash as usual. Repeat twice a week. Baking soda: this kitchen staple can be mixed with a bit of water and applied to the scalp as a paste. Massage it lightly into the scalp, rinse and style your hair as usual. Repeat 1-2 times a week. Your hair might feel dry at first, but your scalp will adjust over time and dandruff will be a thing of the past. Tea tree oil: To fight fungus-related dandruff, add a few drops of tea tree oil in an all-natural shampoo and use normally. Coconut oil: massage 3-5 tablespoons of coconut oil into your scalp once a week and let sit for about an hour. Shampoo twice and style as usual. This will moisturize your scalp and fight any bacteria and fungi that may be causing your dandruff. You can also give sea salt a try. Sea salt is exactly what it sounds like: the salt and minerals that exist in sea water and remain after the water evaporates. Sea salt not only provides plenty of essential minerals but is good for the skin and can be easily used to combat dandruff. Table salt is mined from the ground and refined, stripping most of the nutrients from it. The 82 nutrients in sea salt vary by the body of water from which it comes, which is why you can find different colors and textures. Sea salt removes dead skin cells, making room for bright new skin. How often you should exfoliate depends on your skin type. For normal skin, dermatologists recommend exfoliating once or twice a week to support skin health. Any more often and damage can occur, so be gentle. A natural detoxifier, sea salt pulls toxins out of the skin, which can then be washed away. To use, make a paste of sea salt and water and apply thinly to your skin. Leave on for 1 minute, then gently massage it off in the shower. When it comes to salt, texture is key: very coarse sea salt can scratch skin; very fine is hard to work with. Instead, go for something in between. Part your hair into sections and sprinkle 1-2 teaspoons of sea salt in the parts. With wet fingers, gently massage the salt in circles all over your scalp for about 10 minutes. Wash as usual. The salt will exfoliate dead skin, stimulate new cells, and kill bacteria and fungi. Because it cleans the pores and hair follicles, promotes circulation, and stimulates new cell growth, sea salt also promotes hair growth. Wash your hair as you usually do, then gently massage sea salt into your scalp for 15-20 minutes. Rinse thoroughly. If done twice a week, you’ll see and feel the results of this sea salt massage in about 2 months. 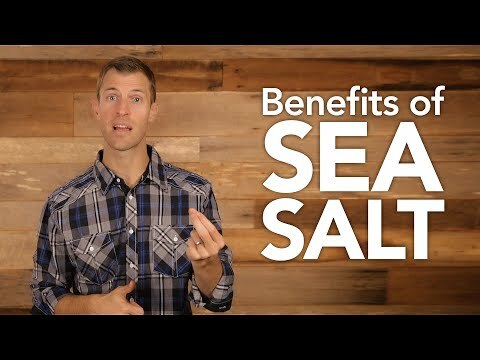 Here’s a short video on the benefits of sea salt and why you should stay away from iodized salt.